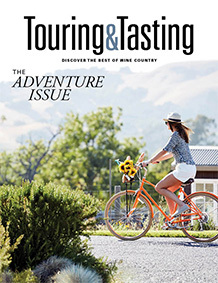 Touring & Tasting is dedicated to giving you the information and inspiration to discover the best of wine country, and this time we're celebrating all things adventure. We have a new look and a couple of neat new features for you including Sip Trips that give you actual itineraries you can follow, and Buzz pages that include fun tips on everything from transportation to where to stay and what to do in wine country. Woodinville is an exciting crossroads for winemaking, microbrewing, fine dining, and outdoor adventure. Follow this three-day itinerary and explore, experience, and enjoy! With spectacular views, incredible wineries, and delicious restaurants, wine country is without a doubt the perfect location for a romantic summertime getaway. Here's how you can arrive in wine country stress-free and in style! We feature hundreds of wines in this issue, so what should you try first? This friendly wine region is finally getting the attention it deserves. Today, Livermore Valley is home to more than 50 wineries that have set the bar high for quality. In beautiful Sonoma County you’ll find plenty of ways to fuel your adventurous yearnings from mild to wild. Explore the Central Coast's most historic wine region. Come as you are and experience the casual and fun of the Santa Maria Valley Wine Country.